Over 25 years helping clients. No legal fees or costs. No-fee policy. Never pay out-of-pocket fees or expenses. Get a confidential review of your case at no cost. Helping clients for over 25 years. Evidence suggests these fires were part of a single, related system failure caused by PG&E’s improper maintenance of utility equipment and surrounding vegetation. If your family, home, or business was affected, you may be entitled to recover monetary damages beyond your insurance policy limits. We encourage North Bay and Butte County residents to learn about the PG&E wildfire lawsuit and understand your legal options. An independent report issued to the California Public Utilities Commission (CPUC) in May 2013 found that PG&E’s aging infrastructure presented “significant safety issues,” particularly in poor weather conditions. In addition, PG&E possessed over 10 years of historical data showing that seasonal winds regularly occur in the region and pose a serious risk to electrical equipment. According to CAL FIRE records, electrical equipment was responsible for approximately 135 fires in Sonoma and Napa Counties between the years 2011 and 2015. In May 2016, government regulators put PG&E on further notice that specific areas of the North Bay faced an elevated risk of power line fires due to strong winds, abundant dry vegetation, and other environmental conditions. Despite this knowledge, recent audits of PG&E’s Sonoma Division alone revealed over 3,500 unattended repair and maintenance requests. In fact, PG&E has a documented practice of diverting substantial funds away from tree-trimming and other critical maintenance programs while reaching nearly $1.4 billion in profits per year. Further, PG&E has maintained an outdated and dangerous practice of using reclosers to automatically restart power after service interruptions. Reclosers send electrical pulses through the system’s power lines whenever an interruption occurs. If such a line is in contact with trees or vegetation, these surges of electricity create a serious risk of starting fires. As the San Francisco Chronicle recently reported, other utility companies such as San Diego Gas & Electric Company and Southern California Edison have ceased this dangerous practice entirely during the fire season. 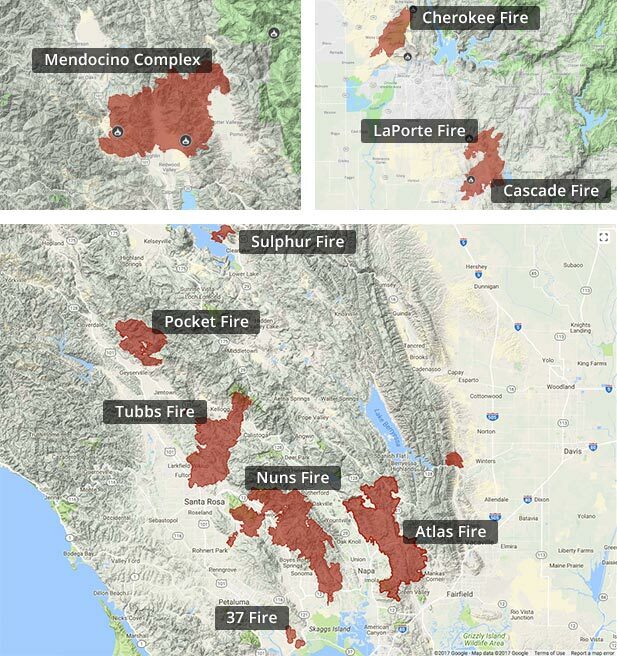 Moreover, PG&E failed to turn off power despite a known forecast of high winds, low humidity, and dry conditions creating a substantial regional fire risk, and further failed to turn off power to mitigate damage once the disaster began. As a result, beginning in the early evening on October 8, 2017, emergency responders received dozens of calls reporting electrical outages, transformer explosions, sparking power lines, and tree fires in close to proximity to PG&E utility equipment. PG&E reported electrical outages near the origins of the Tubbs fire as early as 8:51pm on October 8, 2017. The scope of the resulting fire damage is well known to those in the region, with over 245,000 acres burned, nearly 9,000 homes, businesses, and other structures destroyed, and 44 fire-related deaths. Subsequently, in May and June 2018, CAL FIRE released findings that 16 of the North Bay fires were caused by trees or branches falling onto PG&E power lines in violation of state law, the failure of PG&E-owned power poles resulting in lines and equipment coming into contact with the ground, power line conductors separating from connectors and falling to the ground, and PG&E’s attempt to reenergize downed power lines while the lines were in contact with vegetation. These findings follow a long history of PG&E safety violations that have caused devastating fire damage and explosions. Prior events include the 1994 Trauner fire (739 counts of criminal negligence and $24 million in penalties); the 2003 Mission District Substation fire; the 2008 Rancho Cordova explosion ($38 million in CPUC fines); the 2010 San Bruno explosion (6 felony charges and $1.6 billion in penalties); the 2011 Cupertino explosion; the 2014 Carmel explosion ($36 million in total fines); and the 2015 Butte fire ($98.3 million in fines and costs). Additional allegations set forth PG&E’s role in causing the deadly Camp Fire in November 2018. Negligence. PG&E breached its duty of care to the plaintiffs and the public by failing to comply with safety statutes and regulations, failing to properly maintain its utility equipment and surrounding vegetation, and failing to de-energize hazardous power lines in foreseeable fire conditions. Inverse Condemnation. PG&E is a privately owned public utility and caused the destruction of the plaintiffs’ property without adequate compensation. Public Nuisance. PG&E breached its duty to operate its business in a manner that did not threaten public health and safety. Private Nuisance. PG&E violated the plaintiffs’ right to the free use and enjoyment of their property without unreasonable interference. Premises Liability. PG&E’s improper inspection and maintenance practices caused unsafe conditions to exist on the properties where its utility equipment was located. Trespass. PG&E caused wildfires to enter upon the plaintiffs’ lands resulting in substantial and unauthorized damages. Violation of Public Utilities Code Section 2106. PG&E failed to comply with California laws regulating a public utility provider’s design and maintenance of its electrical infrastructure. Violation of Health and Safety Code Section 13007. PG&E has further statutory liability under the California Health and Safety Code for starting the fires and allowing them to destroy the plaintiffs’ property. Negligent Infliction of Emotional Distress. PG&E’s wrongful conduct caused plaintiffs to suffer serious emotional distress resulting from loss of real and personal property, fleeing the zone of danger, trauma, anxiety, bodily injury, and the injury or death of loved ones. All personal injury, homeowner, and business loss claims against PG&E for the North Bay Fires have been coordinated for pretrial proceedings in San Francisco County Superior Court (California North Bay Fire Cases, Judicial Council Coordination Proceeding No. 4955, Dept. 304). A motion to coordinate Camp Fire claims is also pending. With litigation currently underway, we encourage you to consult an attorney about your claim and understand your legal options. Our attorneys have over 25 years’ experience in coordinated mass tort cases, and we provide all consultations at no cost and with no obligation. Reach our office by phone or through our brief online form at any time to learn how we can help.